Small cell lung cancer (SCLC) is a very aggressive form of lung cancer. SCLC treatment requires multidisciplinary management and timely treatment. Radiation therapy is an important part of management of all stages of SCLC, in the curative as well as in the palliative setting. The role of radiation therapy in all stages of SCLC has changed in recent years; this article describes these changes and highlights the role of radiation therapy in the management of SCLC. Lung cancer is the leading cause of cancer death worldwide . Small cell lung cancer (SCLC) makes up ∼15% of all lung cancer cases  and smoking is its main cause . SCLC is a rapidly progressing disease with high recurrence rates and poor outcomes [4, 5]. About one-third of patients will present with TNM (tumour, node, metastasis) stage I–III SCLC at the time of diagnosis (mostly corresponding to limited disease (LD), which is defined as a tumour burden able to fit within a radiation field) [6–8] and two-thirds will present with stage IV disease (mostly corresponding to extensive disease (ED), i.e. a tumour burden not covered by one radiation field, including malignant pleural effusion and/or distant metastases). 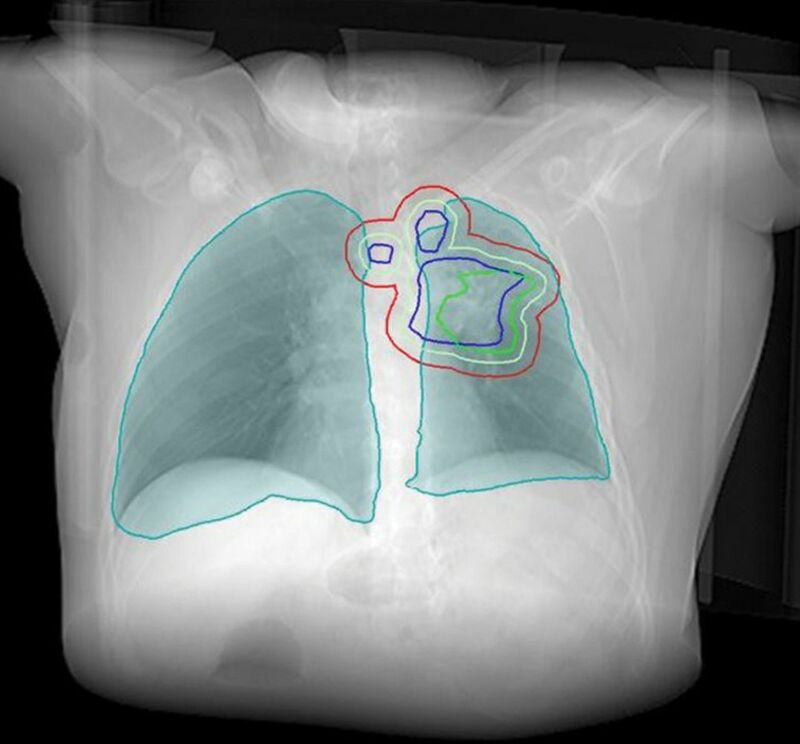 The role of radiotherapy in all stages of SCLC has changed in recent years; this article describes the role of radiotherapy in SCLC. Once the diagnosis of LD-SCLC is established the standard treatment for fit patients will be concurrent radiochemotherapy . Two meta-analyses have demonstrated that combined modality treatment improves survival over radiotherapy alone [10, 11], with further improvements when delivered concurrently [12, 13]. The current standard chemotherapy regime in the treatment of LD-SCLC consists of etoposide and cisplatin (EP) [14–16]. While concurrent radiochemotherapy is the standard, the ideal timing of radiotherapy combined with chemotherapy is debated. SCLC is a chemo-sensitive tumour and rapid responses are often observed; chemotherapy is often initiated first to rapidly counter symptoms and fast tumour growth . Early radiotherapy (starting with the first or second cycle of cisplatin-based chemotherapy) has been shown to lead to improved overall survival compared with delayed radiotherapy [8, 12, 18, 19]. However, a randomised trial by Sun et al. did not confirm a benefit with early RT. Early concurrent radiochemotherapy may not be suitable for all patients. In patients with large tumour volumes or poor performance status, early radiotherapy may increase acute and late toxicities. In these cases a deferred start to radiotherapy or even sequential treatment are the preferred options. Bulky tumours may require large treatment volumes; these can be reduced if initial chemotherapy shrinks the tumour, potentially reducing toxicity to the lungs and oesophagus. Several randomised controlled trials showed no difference in relapse rates when these smaller volumes were treated [21–23]. Most guidelines support early thoracic radiotherapy, beginning with the first or second cycle when cisplatin-based chemotherapy is used [6, 12, 18, 24, 25]. The time between the start of any therapy and the end of radiation therapy is an important predictor of survival in LD-SCLC: prolongation correlates to a decrease in overall survival of 1.9% per week [18, 24]. An updated meta-analysis, based on individual patient data, confirmed increased 5-year survival rates when early and hyper-fractionated irradiation is administered with good chemotherapy compliance . In 1999, Turrisi et al. reported a 5-year overall survival benefit of 10% with four cycles of EP and concurrent twice-daily (1.5 Gy twice-daily, 30 fractions) when compared to once-daily radiotherapy (1.8 Gy, 25 fractions). Since then, the radiotherapy doses used in standard fractionation have increased to ∼60–66 Gy and a direct comparison between the higher dose standard-fractionation and the twice-daily schedule was missing. The potential inconvenience of twice-daily administration and the significantly increased rates of transient grade 3 esophagitis were the main concerns that explain why the twice-daily regimen was not universally adopted (table 1) [30, 31]. The recent CONVERT phase III trial did not demonstrate superiority of once daily radiotherapy with 66 Gy when compared to the aforementioned twice-daily regimen, with both regimens having very similar toxicity rates . Today, twice-daily radiotherapy remains a standard treatment for fit patients, but both regimens may be considered and the patients’ preference should be accommodated. The decision may also be influenced by pragmatic factors such as availability of transportation. An important finding of the CONVERT trial was the relatively favourable 3-year survival rate of ∼40% in both arms, which was probably a result of modern radiation techniques using selective instead of elective nodal irradiation. While Bogart et al. concluded that 70 Gy in 35 daily fractions concurrent with EP has similar outcomes when compared with the trial carried out by Turrisi et al. , we have no direct comparison between these two regimes, to date. An ongoing study is comparing concurrent twice-daily radiotherapy with 70 Gy in daily fractions (ClinicalTrials.gov identifier: NCT00632853). The treatment volume covers the primary tumour and the involved lymph nodes (figures 1 and 2). Whether only areas around malignant lymph nodes (involved field irradiation (IFI)) or elective regions (elective nodal irradiation (ENI)) should be included is still a matter of debate [33, 34], but the trend is moving away from elective volumes, aided by modern imaging such as positron emission tomography/computed tomography (CT) [33, 35–38]. With the smaller volumes of IFI versus ENI toxic side-effects, such as oesophagitis and pneumonitis can be reduced , while maintaining a low rate of isolated nodal failures (3%) . The first step in contouring is to define the gross tumour volume (GTV), which represents the macroscopic tumour, and an iGTV, which represents gross disease taking breathing motion into account. This is performed on modern planning CT scanners capable of obtaining four-dimensional CT scans, which are three-dimensional CT datasets that are correlated with breathing phases. Microscopic tumour extension is addressed by the clinical target volume (CTV), which is typically expanded by adding 5–10 mm to the GTV in all directions (except where natural barriers would be expected, e.g. bone or pleura). Due to positioning and calculation inaccuracies, a further margin is added to create the final planning target volume (PTV) . Radiotherapy target volumes. Blue line: macroscopic disease (GTV); green line: GTV with motion (iGTV); light green: microscopic extension (CTV); red line: the final target volume (PTV). Sample radiation plan. The red line indicates the PTV; red coloured areas are the areas receiving the prescribed radiation dose; green and blue coloured areas receive a lower radiation dose. SCLC is characterised by early metastases and the brain is their most common site with a cumulative incidence of over 50% at 2 years . With prophylactic cranial irradiation (PCI) (figure 3) the risk of brain metastases can be reduced from 59% to 33% at 3 years and is accompanied by a survival benefit (21% versus 15%) [42–44]. PCI should be considered part of standard treatment in patients with LD-SCLC with partial or complete response to initial treatment. Restaging with magnetic resonance imaging (MRI) immediately before PCI can be considered, as patients with overt brain metastases would not qualify for PCI and might require higher dose palliative whole-brain radiotherapy instead . Prophylactic cranial irradiation. a) Stretching a heated mask over the patient; when the mask gets cold it becomes rigid. 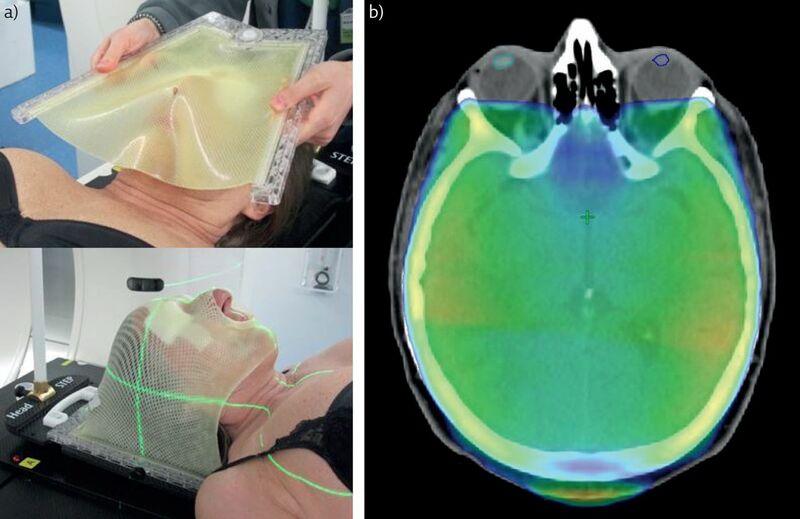 b) Radiation plan for whole-brain radiotherapy, the radiation field encompassing at least 95% of the prescribed radiation dose is shown in green. The use of PCI in very early stage SCLC after surgery has not been investigated sufficiently. As the incidence of brain metastases after completely resected stage I SCLC is low (below 11%), PCI may not to be necessary. In the case of higher pathological stages PCI should be individually discussed, as the incidence of developing brain metastases is up to 30% [46–50]. Neurocognitive deterioration is a potential side-effect of PCI and can be observed in 30–60% of patients [43, 51–53]. An important region for neurocognitive function is located in the hippocampus . Hippocampal sparing cranial irradiation is being investigated (e.g. ClinicalTrials.gov identifier: NCT02058056), but is not widely established in routine clinical practice. An estimated short overall survival (potentially due to comorbidities) might be a contraindication for PCI, it is important to discuss the prognosis of each individual patient. If PCI is omitted, close follow-up with cranial MRI and active treatment of emergent brain metastases might be considered . The standard dose for PCI is 25 Gy in 10 fractions. Higher doses do not improve outcome, but increase mortality  and chronic neurotoxicity . Besides radiochemotherapy , in localised disease (T1/2 N0 M0) surgery may be a treatment option, with reported 5-year survival rates in the order of 50% . Of note, based on published data small peripheral lesions can be occasionally misdiagnosed as SCLC (e.g. typical or atypical carcinoid); however, only 5% of patients with SCLC have true stage I SCLC . Surgery alone is not sufficient due to the high risk of recurrence . Even in R0 resected patients without lymph node involvement adjuvant chemotherapy is recommended . In the case of positive mediastinal lymph nodes, post-operative mediastinal radiation therapy (PORT) should be discussed. Data for PORT in this setting are rare and the decision should be made thoughtfully considering performance status, age, lung function and comorbidities. In addition, it is important to differentiate between pN0, pN1 (no or intrapulmonary/hilar lymph nodes) and pN2 (ipsilateral mediastinal lymph nodes) [56, 59]. In completely resected patients with pN0 or pN1 status evidence for PORT is lacking; however, even in this setting the indication may be discussed. PORT was associated with longer survival in pN+ in a retrospective review of the National Cancer Database . For pN2 LD-SCLC patients the median overall survival significantly improved from 16 to 22 months with PORT in a SEER (Surveillance, Epidemiology, and End Results) analysis . Wong et al. reported a 5-year overall survival of 29% with PORT versus 18.6% without, but prospective trials are missing. The dose is also unclear due to scarce data, but the largest study to date used radiation doses up to 54 Gy in 2 Gy per fraction . In case of R1 resection adjuvant radiotherapy is recommended . Patients with ED-SCLC have a poor prognosis with a median overall survival of 8–13 months [62–64]. Palliative chemotherapy with EP for four to six cycles is the standard treatment [61, 65–67], and has remained unchanged in recent decades. Several trials have assessed whether the addition of thoracic radiotherapy (TRT) might improve outcomes [68–72]. Jeremic et al. found a slight, but statistically significant, benefit in terms of overall survival by adding TRT to patients with complete response after chemotherapy, and these results were later confirmed [69, 70]. The most recent randomised trial is the CREST study by Slotman et al. . TRT with 30 Gy (10×3 Gy) in patients with any response after 4–6 cycles of chemotherapy led to a 2-year survival rate of 13% compared with 3% without TRT, although the primary end-point (1-year overall survival) was not met (1-year overall survival of 33% versus 28%). A meta-analysis of the two randomised trials concluded that TRT improves overall survival and progression-free survival in patients with extensive stage SCLC . The timing of TRT is not as critical as in the curative setting and can accommodate recovery from side-effects of chemotherapy . In an older randomised trial , PCI significantly reduced symptomatic brain metastases in ED-SCLC (14.6% versus 40.4%) and increased overall survival at 1 year (27.1% versus 13.3%). A limitation of this study was that no brain imaging was required before PCI. Recently, a Japanese randomised phase III trial in the same setting showed a detrimental effect of PCI on median overall survival (11.6 months versus 13.7 months) when rigid brain imaging is applied . Presumably, previous trials showed a benefit for PCI because undetected manifest brain metastases were treated. In light of these findings, MRI monitoring for brain metastases is a reasonable option for these patients if accessible. Radiotherapy is an important pillar in palliative lung cancer therapy . Symptoms due to tumour obstruction of the bronchial tree or large vessels such as the vena cava superior are also indications for radiotherapy, especially if active systemic therapy is not available. Radiotherapy is effective at palliating pain due to cancerous lesions (e.g. of the pleura, bones or soft tissues). Haemoptysis is another severe and potentially dangerous complication of lung tumours, especially in the case of diffuse slow bleeding or bleeding from locations not accessible using endoscopic interventions, and radiotherapy can be an effective treatment option . For patients diagnosed with synchronous brain metastases therapeutic whole brain radiation therapy (10×3 Gy or 5×4 Gy) is recommended in current guidelines . Stereotactic radiotherapy/radiosurgery is typically not a first choice due to the high rate with which further brain metastases can be expected in SCLC. For brain metastases after failed whole-brain radiotherapy, stereotactic radiotherapy is an option [78–82]. The delivery of highly focused radiation can potentially reduce neurotoxicity and make re-irradiation feasible , especially for patients with controlled systemic disease . Radiotherapy plays an important role in the treatment of every stage of SCLC (table 2). Concurrent chemotherapy is typically platinum-etoposide therapy. Whenever possible, radiochemotherapy with early radiotherapy is preferred in LD-SCLC. PCI is recommended in patients with a response to radiochemotherapy in LD-SCLC. For ED-SCLC the standard treatment is a combination of platinum and etoposide. TRT after chemotherapy and PCI for ED-SCLC are options which should be discussed critically. Intrathoracic symptoms such as obstruction due to tumour mass, pain or haemoptysis can often be treated with radiotherapy in the palliative setting. Symptoms caused by extrathoracic metastases can also be treated with radiotherapy. Interdisciplinary collaboration is essential to facilitate adequate treatment considering all aspects of care.
. Cancer statistics, 2015. CA Cancer J Clin 2015; 65: 5–29.
. Small cell lung cancer. Mayo Clin Proc 2008; 83: 355–367. , et al. Cigarette smoking and lung cancer—relative risk estimates for the major histological types from a pooled analysis of case–control studies. Int J Cancer 2012; 131: 1210–1219.
. Origins, genetic landscape, and emerging therapies of small cell lung cancer. Genes Dev 2015; 29: 1447–1462. , et al. Small-cell lung cancer (SCLC): ESMO Clinical Practice Guidelines for diagnosis, treatment and follow-up. Ann Oncol 2013; 24: Suppl. 6, vi99–vi105. , et al. International trends in lung cancer incidence by histological subtype: adenocarcinoma stabilizing in men but still increasing in women. Lung Cancer 2014; 84: 13–22. , et al. Importance of timing for thoracic irradiation in the combined modality treatment of limited-stage small-cell lung cancer. The National Cancer Institute of Canada Clinical Trials Group. J Clin Oncol 1993; 11: 336–344. , et al. Treatment of limited stage small cell lung cancer: the multidisciplinary team. Eur Respir J 2017; 50: 1700422.
. Does thoracic irradiation improve survival and local control in limited-stage small-cell carcinoma of the lung? A meta-analysis. J Clin Oncol 1992; 10: 890–895. , et al. A meta-analysis of thoracic radiotherapy for small-cell lung cancer. N Engl J Med 1992; 327: 1618–1624. , et al. Systematic review evaluating the timing of thoracic radiation therapy in combined modality therapy for limited-stage small-cell lung cancer. J Clin Oncol 2004; 22: 4837–4845.
. Limited-stage small cell lung cancer: current chemoradiotherapy treatment paradigms. Oncologist 2010; 15: 187–195. , et al. The superiority of combination chemotherapy over single agent chemotherapy in small cell lung carcinoma. Cancer 1979; 44: 406–413. , et al. Treatment of bronchogenic carcinoma with simultaneous or sequential combination chemotherapy, including methotrexate, cyclophosphamide, procarbazine and vincristine. Cancer 1976; 38: 2208–2216.
. Is there a case for cisplatin in the treatment of small-cell lung cancer? A meta-analysis of randomized trials of a cisplatin-containing regimen versus a regimen without this alkylating agent. Br J Cancer 2000; 83: 8–15. , et al. CT findings of early-stage small cell lung cancer in a low-dose CT screening programme. Lung Cancer 2007; 56: 207–215. , et al. Timing of chest radiotherapy in patients with limited stage small cell lung cancer: a systematic review and meta-analysis of randomised controlled trials. Cancer Treat Rev 2007; 33: 461–473. , et al. Early compared with late radiotherapy in combined modality treatment for limited disease small-cell lung cancer: a London Lung Cancer Group multicenter randomized clinical trial and meta-analysis. J Clin Oncol 2006; 24: 3823–3830. , et al. Phase III trial of concurrent thoracic radiotherapy with either first- or third-cycle chemotherapy for limited-disease small-cell lung cancer. Ann Oncol 2013; 24: 2088–2092. , et al. Phase III comparison of twice-daily split-course irradiation versus once-daily irradiation for patients with limited stage small-cell lung carcinoma. J Clin Oncol 1999; 17: 2681–2681. , et al. Long-term results of a phase III trial comparing once-daily radiotherapy with twice-daily radiotherapy in limited-stage small-cell lung cancer. Int J Radiat Oncol Biol Phys 2004; 59: 943–951. , et al. Multimodal therapy for limited small-cell lung cancer: a randomized study of induction combination chemotherapy with or without thoracic radiation in complete responders; and with wide-field versus reduced-field radiation in partial responders: a Southwest Oncology Group Study. J Clin Oncol 1987; 5: 592–600. , et al. Time between the first day of chemotherapy and the last day of chest radiation is the most important predictor of survival in limited-disease small-cell lung cancer. J Clin Oncol 2006; 24: 1057–1063. , et al. Impact of thoracic radiotherapy timing in limited-stage small-cell lung cancer: usefulness of the individual patient data meta-analysis. Ann Oncol 2016; 27: 1818–1828. , et al. Twice-daily compared with once-daily thoracic radiotherapy in limited small-cell lung cancer treated concurrently with cisplatin and etoposide. N Engl J Med 1999; 340: 265–271. , et al. Phase II study of accelerated high-dose radiotherapy with concurrent chemotherapy for patients with limited small-cell lung cancer: Radiation Therapy Oncology Group protocol 0239. Int J Radiat Oncol Biol Phys 2012; 83: e531–e536. , et al. Randomized phase II trial comparing twice daily hyperfractionated with once daily hypofractionated thoracic radiotherapy in limited disease small cell lung cancer. Acta Oncol 2016; 55: 591–597. , et al. CONVERT: An international randomised trial of concurrent chemo-radiotherapy (cCTRT) comparing twice-daily (BD) and once-daily (OD) radiotherapy schedules in patients with limited stage small cell lung cancer (LS-SCLC) and good performance status (PS). J Clin Oncol 2016; 34: Suppl., abstr 8504.
, et al. Management of small-cell lung cancer with radiotherapy–a pan-Canadian survey of radiation oncologists. Curr Oncol 2016; 23: 184–195. , et al. Radiotherapy patterns of care study in lung carcinoma. J Clin Oncol 2003; 21: 4553–4559. , et al. 70 Gy thoracic radiotherapy is feasible concurrent with chemotherapy for limited-stage small-cell lung cancer: analysis of Cancer and Leukemia Group B study 39808. Int J Radiat Oncol Biol Phys 2004; 59: 460–468. , et al. Total gross tumor volume is an independent prognostic factor in patients treated with selective nodal irradiation for stage I to III small cell lung cancer. Int J Radiat Oncol Biol Phys 2013; 85: 1319–1324. , et al. Report from the International Atomic Energy Agency (IAEA) consultants’ meeting on elective nodal irradiation in lung cancer: small-cell lung cancer (SCLC). Int J Radiat Oncol Biol Phys 2008; 72: 327–334. , et al. Selective nodal irradiation on basis of 18 FDG-PET scans in limited-disease small-cell lung cancer: a prospective study. Int J Radiat Oncol Biol Phys 2010; 77: 329–336. , et al. 18 FDG-PET based radiation planning of mediastinal lymph nodes in limited disease small cell lung cancer changes radiotherapy fields: a planning study. Radiother Oncol 2008; 87: 49–54. , et al. 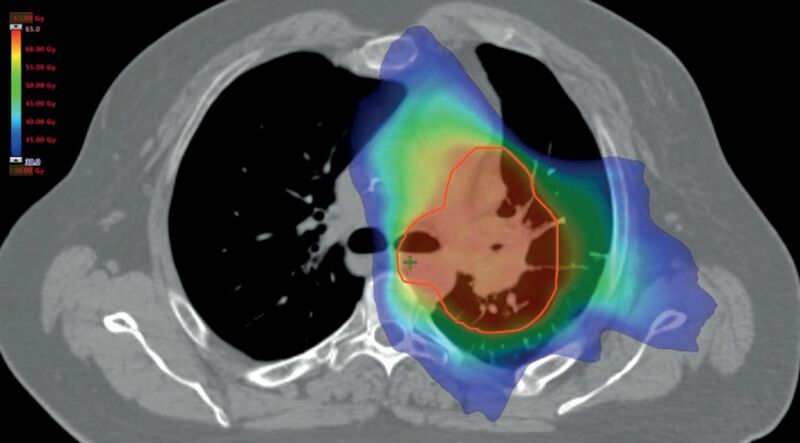 Positron emission tomography/computed tomography-guided intensity-modulated radiotherapy for limited-stage small-cell lung cancer. Int J Radiat Oncol Biol Phys 2012; 82: e91–e97. , et al. Selective nodal irradiation on basis of (18)FDG-PET scans in limited-disease small-cell lung cancer: a prospective study. Int J Radiat Oncol Biol Phys 2010; 77: 329–336. , et al. A randomized study of involved-field irradiation versus elective nodal irradiation in combination with concurrent chemotherapy for inoperable stage III nonsmall cell lung cancer. Am J Clin Oncol 2007; 30: 239–244.
. The place of radiotherapy in the palliative management of NSCLC. Breathe 2011; 8: 134–143. , et al. Prophylactic cranial irradiation for patients with small-cell lung cancer in complete remission. J Natl Cancer Inst 1995; 87: 183–190. , et al. Prophylactic cranial irradiation for patients with small-cell lung cancer in complete remission. Prophylactic Cranial Irradiation Overview Collaborative Group. N Engl J Med 1999; 341: 476–484. , et al. Primary analysis of a phase II randomized trial Radiation Therapy Oncology Group (RTOG) 0212: impact of different total doses and schedules of prophylactic cranial irradiation on chronic neurotoxicity and quality of life for patients with limited-disease small-cell lung cancer. Int J Radiat Oncol Biol Phys 2011; 81: 77–84. , et al. Prophylactic cranial irradiation for patients with small-cell lung cancer: a systematic review of the literature with meta-analysis. BMC Cancer 2014; 14: 793.
, et al. Detection of brain metastases from small cell lung cancer: consequences of changing imaging techniques (CT versus MRI). Cancer 2008; 112: 1827–1834.
. Outcome of surgery for small cell lung cancer – response to induction chemotherapy predicts survival. Thorac Cardiovasc Surg 2004; 52: 206–210. , et al. Phase II trial of postoperative adjuvant cisplatin and etoposide in patients with completely resected stage I-IIIa small cell lung cancer: the Japan Clinical Oncology Lung Cancer Study Group Trial (JCOG9101). J Thorac Cardiovasc Surg 2005; 129: 977–983. , et al. Patterns of recurrence and outcome in patients with surgically resected small cell lung cancer. Int J Clin Oncol 2012; 17: 218–224. , et al. Factors affecting the risk of brain metastasis in small cell lung cancer with surgery: is prophylactic cranial irradiation necessary for stage I-III disease? Int J Radiat Oncol Biol Phys 2013; 85: 196–200. , et al. Risk factors for brain metastases in completely resected small cell lung cancer: a retrospective study to identify patients most likely to benefit from prophylactic cranial irradiation. Radiat Oncol 2014; 9: 216.
, et al. Phase III trial of prophylactic cranial irradiation compared with observation in patients with locally advanced non–small-cell lung cancer: neurocognitive and quality-of-life analysis. J Clin Oncol 2010; 29: 279–286. , et al. Decline in tested and self-reported cognitive functioning after prophylactic cranial irradiation for lung cancer: pooled secondary analysis of Radiation Therapy Oncology Group randomized trials 0212 and 0214. Int J Radiat Oncol Biol Phys 2013; 86: 656–664. , et al. Standard-dose versus higher-dose prophylactic cranial irradiation (PCI) in patients with limited-stage small-cell lung cancer in complete remission after chemotherapy and thoracic radiotherapy (PCI 99-01, EORTC 22003-08004, RTOG 0212, and IFCT 99-01): a randomised clinical trial. Lancet Oncol 2009; 10: 467–474. , et al. Why and how to spare the hippocampus during brain radiotherapy: the developing role of hippocampal avoidance in cranial radiotherapy. Radiat Oncol 2014; 9: 139.
, et al. Management of brain metastasis with magnetic resonance imaging and stereotactic irradiation attenuated benefits of prophylactic cranial irradiation in patients with limited-stage small cell lung cancer. BMC Cancer 2015; 15: 589.
, et al. Survival outcomes with the use of surgery in limited-stage small cell lung cancer. Cancer 2010; 116: 1350–1357.
. The applicability of the proposed IASLC staging revisions to small cell lung cancer (SCLC) with comparison to the current UICC 6th TNM Edition. J Thorac Oncol 2009; 4: 300–310. , et al. Adjuvant chemotherapy following surgical resection for small-cell carcinoma of the lung. J Clin Oncol 1988; 6: 832–838. , et al. Assessing the impact of postoperative radiation therapy for completely resected limited-stage small cell lung cancer using the national cancer database. J Thorac Oncol 2016; 11: 242–248. , et al. Indications for adjuvant mediastinal radiotherapy in surgically resected small cell lung cancer. Ann Thorac Surg 2017; 103: 1647–1653.
. NCCN clinical practice guidelines in oncology small cell lung cancer 1.2016. Fort Washington, National Comprehensive Cancer Network, 2016.
, et al. Could we expect to improve survival in small cell lung cancer? Lung Cancer 2007; 57: Suppl. 2, S30–S34. , et al. Irinotecan plus cisplatin compared with etoposide plus cisplatin for extensive small-cell lung cancer. N Engl J Med 2002; 346: 85–91. , et al. Trends in the outcomes for patients with limited stage small cell lung cancer: an analysis of the surveillance, epidemiology, and end results database. Lung Cancer 2009; 64: 226–231. , et al. Cisplatin and etoposide regimen is superior to cyclophosphamide, epirubicin, and vincristine regimen in small-cell lung cancer: results from a randomized phase III trial with 5 years’ follow-up. J Clin Oncol 2002; 20: 4665–4672.
. Extensive-stage small-cell lung cancer: evolution of systemic therapy and future directions. Clin Lung Cancer 2008; 9: 262–270.
. Management of small cell lung cancer: ACCP evidence-based clinical practice guidelines (2nd edition). Chest 2007; 132: Suppl., 324S–339S. , et al. Role of radiation therapy in the combined-modality treatment of patients with extensive disease small-cell lung cancer: a randomized study. J Clin Oncol 1999; 17: 2092–2092. , et al. Thoracic radiation therapy improves the overall survival of patients with extensive-stage small cell lung cancer with distant metastasis. Cancer 2011; 117: 5423–5431. , et al. Clinical outcomes of extensive stage small cell lung carcinoma patients treated with consolidative thoracic radiotherapy. Clin Lung Cancer 2011; 12: 375–379. , et al. Clinical trial of post-chemotherapy consolidation thoracic radiotherapy for extensive-stage small cell lung cancer. Radiother Oncol 2012; 102: 234–238. , et al. Efficacy of 3D conformal thoracic radiotherapy for extensive-stage small-cell lung cancer: a retrospective study. Exp Ther Med 2015; 10: 671–678. , et al. Use of thoracic radiotherapy for extensive stage small-cell lung cancer: a phase 3 randomised controlled trial. Lancet 2015; 385: 36–42. , et al. Thoracic radiotherapy for extensive stage small-cell lung cancer: a meta-analysis. Clin Lung Cancer 2016; 17: 239–244. , et al. Timing of thoracic radiotherapy in the treatment of extensive-stage small-cell lung cancer: important or not? Radiat Oncol 2017; 12: 42.
, et al. Prophylactic cranial irradiation in extensive small-cell lung cancer. N Engl J Med 2007; 357: 664–672. , et al. Prophylactic cranial irradiation versus observation in patients with extensive-disease small-cell lung cancer: a multicentre, randomised, open-label, phase 3 trial. Lancet Oncol 2017; 18: 663–671. , et al. Clinical outcomes of reirradiation of brain metastases from small cell lung cancer with Cyberknife stereotactic radiosurgery. J Cancer Res Ther 2012; 8: 411–416. , et al. Stereotactic radiosurgery for patients with brain metastases from small cell lung cancer. Int J Radiat Oncol Biol Phys 2011; 81: e21–e27. , et al. Efficacy and limitations of salvage gamma knife radiosurgery for brain metastases of small-cell lung cancer after whole-brain radiotherapy. Acta Neurochir (Wien) 2013; 155: 107–113. , et al. The role of radiosurgery in patients with brain metastasis from small cell lung carcinoma. J Korean Neurosurg Soc 2011; 50: 99–102. , et al. Gamma knife stereotactic radiosurgery as salvage therapy after failure of whole-brain radiotherapy in patients with small-cell lung cancer. Int J Radiat Oncol Biol Phys 2012; 83: e53–e59.
. Is stereotactic radiosurgery a rational treatment option for brain metastases from small cell lung cancer? A retrospective analysis of 70 consecutive patients. BMC Cancer 2015; 15: 95.
, et al. Local recurrence and survival following stereotactic radiosurgery for brain metastases from small cell lung cancer. Pract Radiat Oncol 2015; 5: e37–e44.